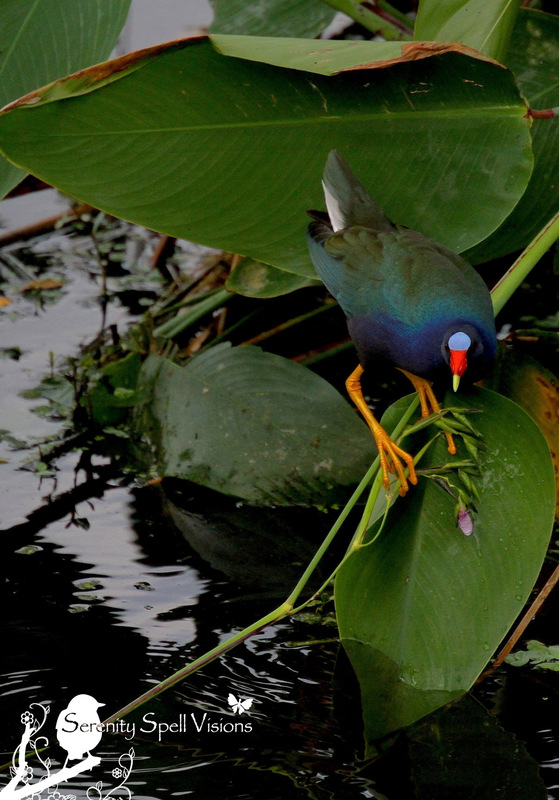 Purple Gallinules are one of the shyer creatures of our wetlands, and to spy one is always fun. It’s ironic that they’re so timid, given their bold coloring. But it’s always a joy to watch these purple, blue, and green gems — especially since they’re my favorite colors, wrapped up into one bright little bird. These lovely creatures live in the freshwater marshes of the southeastern United States, as well as in Central America and the Caribbean. There’s no mistaking this medium-sized rail, with its purple-blue plumage, green back, pale blue forehead, white undertail (of which I’ve caught more than one glimpse), bright red and yellow bill, and long yellow legs. The juveniles sport blander, brown colorations. The gallinules’ long legs make them *seemingly* awkward fliers, so short bursts of activity are their mode of transportation — or swimming like a duck if they’re not navigating the marsh with those dangling legs. They nest in well-hidden floating constructs in the wetlands, laying 5-10 eggs. 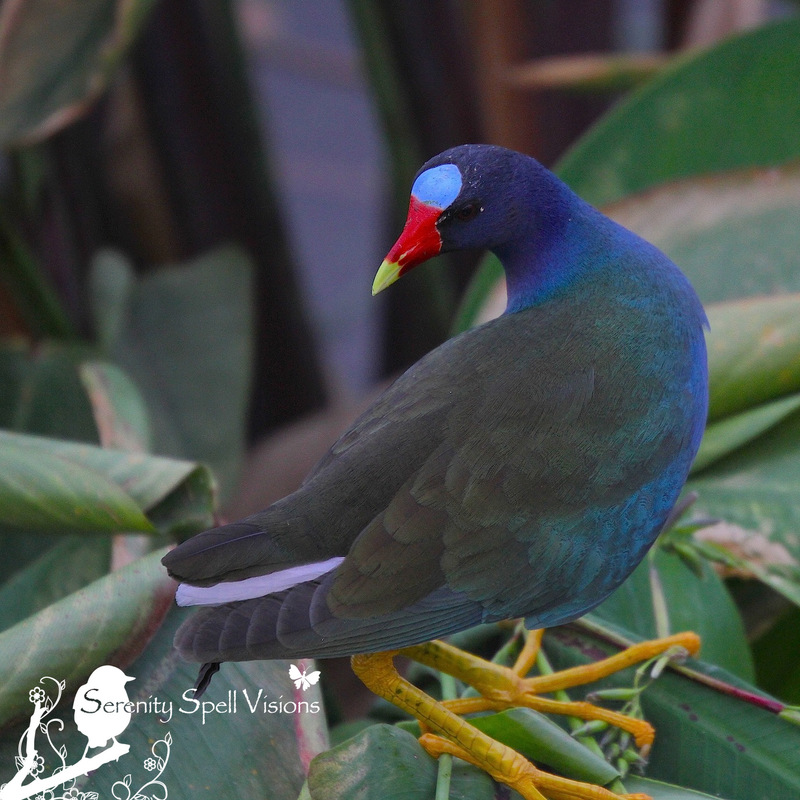 The Purple Gallinule is omnivorous, eating the seeds, leaves, fruits, and grains of both aquatic and terrestrial plants; they also enjoy insects, frogs, snails, spiders, earthworms, fish, and even the eggs and young of other birds. 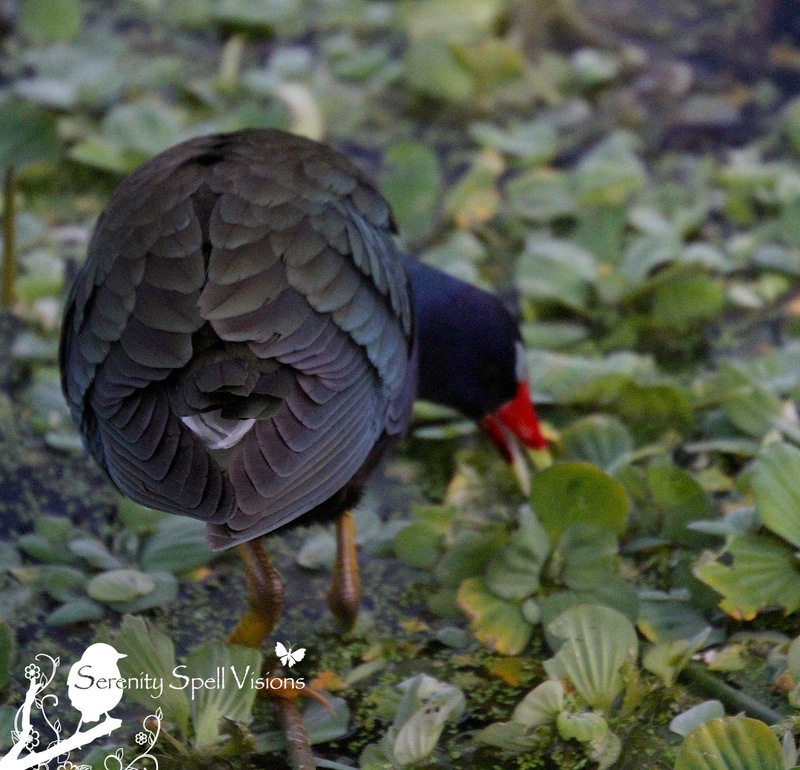 When I see them in our wetlands, they’re often alone, nestled in the vegetation and cackling away — or being chased by other birds, most often by their sister species the Common Moorhen. Despite the appearance of an awkward flier, Purple Gallinules have flown far from their home tropical marshes. They’ve turned up in the northern U.S., Canada, and even Europe and South Africa! Beautiful birds, and your photos certainly do the justice! Aw cute little birds! And so colorful. Haha they have huge feet. Great photos. I want to try to paint one of these birds. A painting would be wonderful — their colors are just divine! In all the many years I birded with my mother the expert birder, I can never recall her pointing out to me a bird’s heinie-feathers. hahahahahahaha! and hahahahahahaha! again: ahhhahahahahahaha! sometimes ya just gotta call a heinie a heinie and move on! Oh yay! I can’t wait to see how much you love it… B/C I know you will! It’s so fascinating to get this rare glimpse. Oh indeed I loved it. I felt such a kinship with his brain…. he liked what he liked, so there! Feel sad that he’s dead, dangit. Do we know what happened to his cats? Wasn’t he just wonderful? I just saw an image with him and his kitties… Talk about LOVE! I’m SURE they were well cared for!! I’ve seen that photo before of Mr Gorey and his cat fan club. Lovely! hard to believe the author got permission so quickly to photograph the house…. Love those yellow feet. Seems their awkward qualities remind me of Coots. Most definitely!! 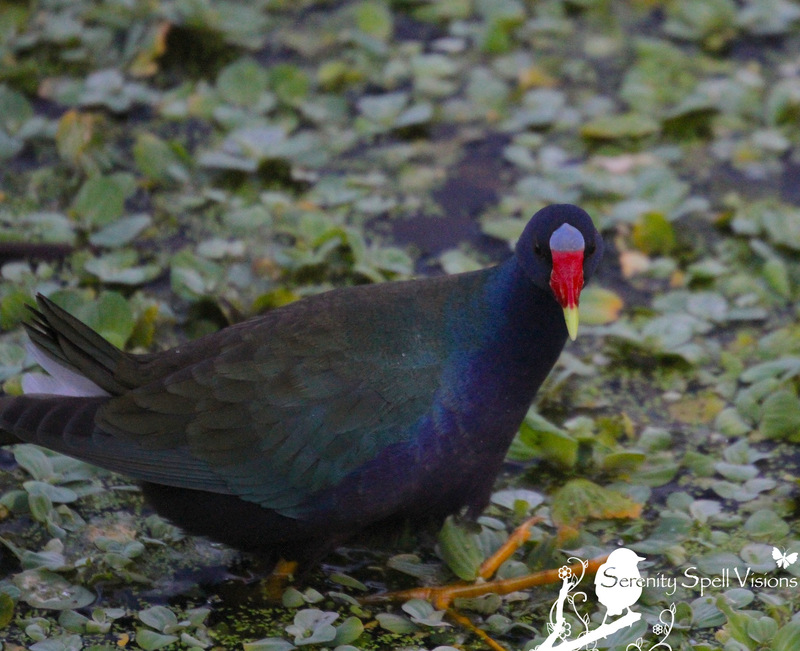 Coots, gallinules, and rails tend to be lumped together in birds’ classifications — similar body types, and those dangling legs and FEET to navigate the mucky wetlands! Brilliant colors you have captured in these birds thank you for sharing with us. Thanks so much! I was VERY happy to get as close as I did to these normally timid guys, who are usually far in the waters…. Loving your captures – what a unique, colored bird:) Have a Great One! They really are so very beautiful, and truly unique! I remember the first time I saw one, I was completely stupefied. Such a jewel! 🙂 Thanks so much…..
Oh how lucky of you to see them so well! I always seem to see them at a great distance and fleetingly. Beautiful! I really was SO lucky! You’re completely right — with me too, they’re usually very far in the wetlands, and I catch a flash of purple darting into the vegetation. 🙂 This guy was really close, and unusually brave — I was thrilled!! Their feet are a treat to see — so very necessary to navigate the muck of the swamp and marsh. We don’t have much shellfish around here, at least in the environment they live in… But perhaps in other areas! Oh wow! Fantastics shots of this colorful beauty!! And lucky you to get to see and photograph it. I unfortunately have to be content with it’s cousin the common moorhen which is not very exciting at all. Omigosh!! What a brave (or stupid? or blind?) little bird….! They usually steer fairly clear of the gators. Hahaaa…. That’s great. Ah, we have LOTS of moorhen, too…. I always think they’re laughing at me when I miss the good shots. Thank you for a chance to see yet another beauty in creation. How many I have been introduced to by you, I cannot even count!!! Aw, that’s such a wonderful thing to say — I’m so happy! Thank you!! What gorgeous colours, but I reckon evolution was laughing when it created those feet! 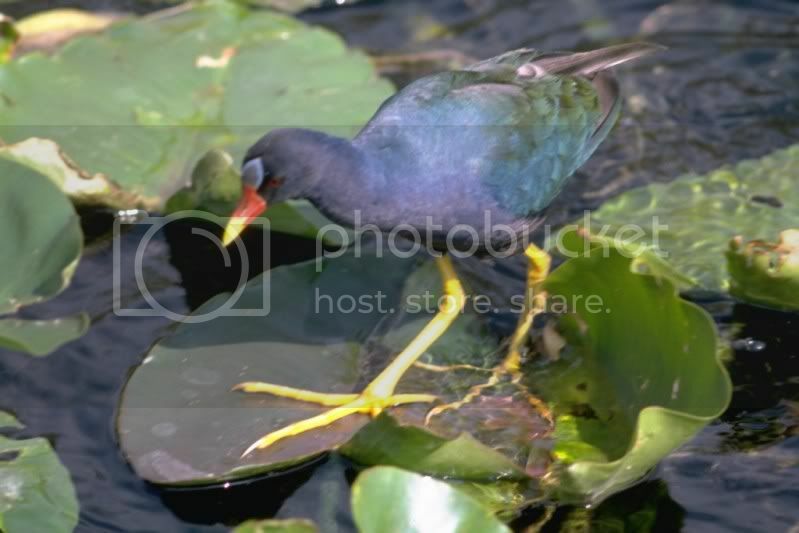 I’ve seen photos of them walking and standing on lily pads with those gigantic feet (like in this photo: http://i76.photobucket.com/albums/j15/mmeara/Birds/gallinule_1024.jpg). I thought maybe that’s why they are so huge. Oh yah, I’ve seen them walking around the aquatic plants in a similar manner…. I’m sure it helps for sure! But when I see them in that deep muck — wooo. They need that support! All of them are very nice. But there is something about the last one, that I like the most. I like the way it’s framed with all those leaves. Aside from this, have you tried deleting my old blog’s subscription, and subscribing this new one? I wonder why that gave you trouble. Ah…. Great idea. I’m going to try this now. But I don’t know — it’s not even showing in my Blogger acct. This is so strange. And the new site isn’t allowing my email address, because I’m already there! Weird. It looks similiar to our Hawaiian Moorhen and Hawaiian Coot except this bird is way prettier. 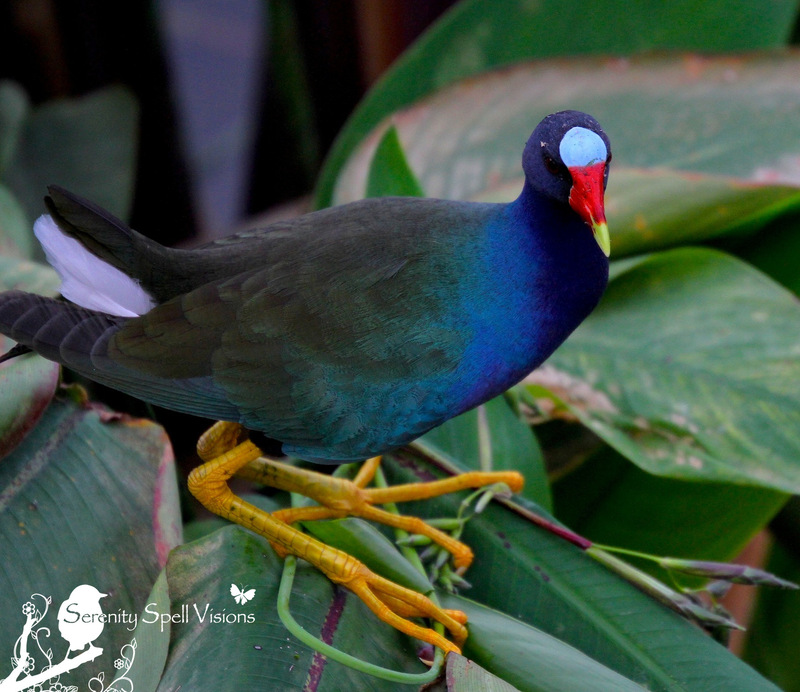 The Purple Gallinule is definitely in the same family…. I don’t know enough about classifications, but I know Coots, Rails, and Moorhens are always grouped together! Your moorhens are like our Common Moorhens, of which we have MANY — laughing away. 🙂 And your coot is like ours, too — I just posted about them! Oh no….! I’m running a day or two behind, but I DID get your last one (I was able to go through, at least)!! You are right. They are lovely creatures. And your photos are terrific! Beautiful. It almost looks like a paint by number bird – never seen anything like that. Ha, that’s great — so true! The first time I saw one in the wild, I was thrilled. What…is…this….BIRD? Of course it’s common here in the winter, but so very brilliant. Ah, it’s so nice to meet you! Thanks very much for dropping by – and thanks so much for the kind words! I feel honored to be surrounded with such beauty, and I hope that it may be forever protected from the whims of human development. This would make a good (and certainly colorful) Halloween costume. Hee, another blogger compared it to a paint-by-number bird…. 😉 They’re seriously unreal. What a spectacular bird. I have never seen one, even though you say they have been as far as SA before. You are right, seems odd to be so shy when you’ve decided to dress up with such flair and colour. I can’t fathom HOW they made it that far, but the pros say they have – they fly in such short bursts here. I love beauty and your photos are magnificent but I imagine its not nearly as exquisite as actually seeing one of those magnificent birds up close in person. Thanks so very much! You’re completely right, of course…. These guys’ (all of them, really) beauty is so AWE-some, that it’s difficult to portray. Seeing them in their natural environment is still an amazing experience for me….! Ugh, I’m sorry about that! I guess I didn’t realize I have to physically go into your page to link…? These guys are so unusual, and intensely beautiful. I just love them. I was going to say we don’t have these here, but I would have been wrong. We have the coots, of course, and moor hens. But some exploration tells me they’re “common” along the Upper Texas Coast, including at Anahuac Wildlife Refuge, where I saw the pink dragonfly. I’d best adjust my expectations and start looking around. The key is “fresh water marshes”. I’m around mostly salt or brackish water. I’ll have to travel to see them. Wow, what bright-colored birds! They’re beautiful birds that I’ve never seen before. Very cool! What amazing and pretty beaks they have. Lovely shots! Amazing pictures of too cute birds! Thanks for sharing this! If you like waterfowl you should check out the palm beach zoo which has one of the largest collection of waterfowl and they are even the only zoo to breed some of the waterfowl they have! I was never a huge fan of all the ‘ducks’ when I worked there, but really appreciated what cool species we had due to their rarity.